The UN's World Food Program (WFP) and Agriculture and Food Organization (FAO) celebrated World Food Day today, October 16. The goal of the organizations is to fight world hunger. Ertharin Cousin is an executive director of the WFP. She appealed to the global community to take action to achieve a world without hunger. Ms. Cousin said, "Working together, we can all press for the changes that the world needs, including ending extreme poverty, supporting small-holder farmers and ensuring access to nutritious food all year round for the most vulnerable people by investing in social protection programs". WFP invited everyone to mark World Food Day by posting #ZeroHunger on social media. The organization asks people to join a new community Facebook page. It gives Facebook users a tool to switch their profile page to include a striking white circle. It represents the target of Zero Hunger. Ms. Cousin says, "The UN Zero Hunger Challenge represents the goal we all share and the world we want." Joining the campaigns to observe World Food Day is a Japanese non-profit organization, Table for Two, or TFT. It is holding a "One Million Itadakimasu" campaign from October 16 to November 30. Itadakimasu is a Japanese word that expresses gratitude for food. Japanese say the word before they eat every meal. TFT invites people worldwide to submit photos of their own rice ball to its website. Businesses will donate five meals for every photo submitted. The organization also held fund-raising events in the U.S. cities of New York, Washington and Chicago. In the 2015 report on food insecurity, the WFP says 795 million people suffer from hunger today. It is fewer than 10 years ago. 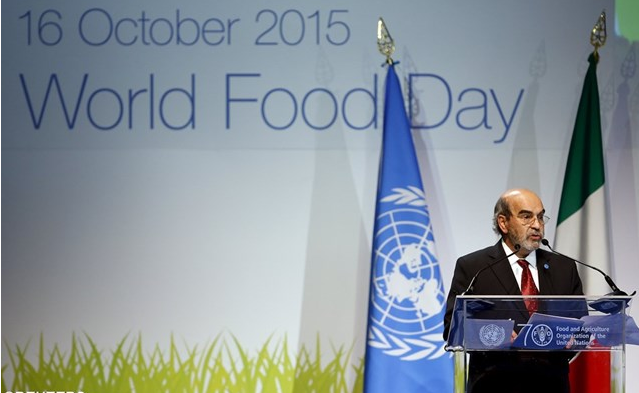 But U.N. Secretary-General Ban Ki Moon said the goal is to end hunger by 2030. "Hunger is more than a lack of food. It's a terrible injustice, unfairness and inequality. We are here today to pledge again to achieve food security for all the people around the world – to build a global movement to end hunger. This will go hand in hand with greater health, economic development and social inclusion for individuals and societies." The University is headed by a Rector, its chief executive officer. Young birds are very vulnerable to predators. Each night when I got home from work I pored over magzines, newspapers, and books about Congress and Campaigns. There are no words to express the full measure of my gratitude. 1.Ertharin Cousin is an executive director of the WFP. She appealed to the global community to take action to achieve a world without hunger. Does the idea of working for a venture company appeal to you ? We should find peaceful ways of settling international disputes rather than appeal to arms. 2.Ms. Cousin said, "Working together, we can all press for the changes that the world needs, including ending extreme poverty, supporting small-holder farmers and ensuring access to nutritious food all year round for the most vulnerable people by investing in social protection programs". The only access to the town is across the bridge. In any case, access to these environments should be carefully managed and scheduled.